We're Almost At Our Goal of 100 Bears for the Holidays! We're more than halfway toward our goal of providing 100 Bears for the Holidays! YOU can help get us there! 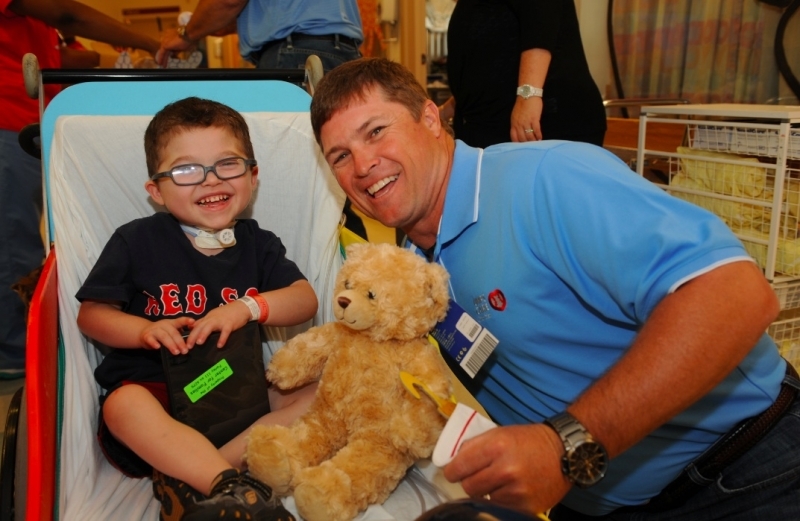 The Holidays are a time for giving and YOU can give the gift of a teddy bear to a sick child who needs a reason to smile. This month, with your help, we aim to raise enough funds to cover one BLUE for Kids Hospital visit during the 2019 Major League Baseball season. Just 100 people donating $50 or more helps us give a Build-A-Bear Workshop experience to 100 children who deserve the comfort of a furry friend and a smile in a time of need. These small gifts go a long way in helping lift the spirits and brighten the mood of young patients across the country.Help us bring the warmth of a teddy bear to 100 kids! Donate with a click: 100 BEARS! These moments matter, hear what one mother said in a note to UMPS CARE after we visited her daughter in the hospital, "Thank you so much!!! My daughter loved her puppy! It took me hours of coaxing her to try and get out of bed and it made her day to get a puppy! Thank you from the bottom of my heart for adding a little glimmer of light to my daughter's eyes that day! As a parent, it's very hard to sit back and watch your child suffer and be in pain and if for only a few minute, you provided that distraction for her. Again, thank you!!"